Ken Zierer has won the first WSP sanctioned Article Literature Award at the Sarasota National Stamp Show. Ken’s article “The Dubious Origins of the Scott Listed Variety #424e” received one of the seven Large Gold medals awarded to the 32 submitted articles. 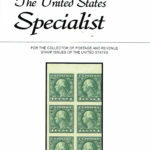 The article, published in 2018 in three parts, in the May, June and July issues of The United States Specialist can be found by browsing the digitial Specialist. The competition, the first ever for philatelic articles at a World Series of Philately (WSP) show was judged by Peter McCann, Chief Judge, Patricia Walker and Patrick Walters. It would appear from the favorable reaction by the collectors at the Sarasota event, that this new form of article competition, might become a semiannual event at WSP shows. USSS Will hold its 2019 Annual Meeting at Westpex San Francisco Airport Marriott Waterfront, 1800 Old Bayshore Highway, Burlingame, CA 94010. Visit the show website at Westpex.com. Each year the Society holds an annual meeting at a different World Series of Philately show. In addition to presentations by members, we also hold our traditional Fellowship Diner and those members who exhibit at the show are eligible for the Hugh M. Southgate Award for the best multi-frame exhibit and the W. Wallace Cleland Award for the best single frame exhibit. These awards are only available at our annual meeting. Please take a few minutes to stop by our booth. It may prove to be the most enjoyable time you spend at the show. USSS Booklets and Booklet Panes Committee Chairman Michael 0 Perry and USSS Dummy Stamps Study Group Chairman Terry R. Scott have each been awarded the USSS George W. Brett Century of Service Award. The Award was presented at the General Membership Meeting held at Milcopex, September 15, 2018. The citations accompanying the Awards are published in the November, 2018 issue of The United States Specialist. The United States Stamp Society has agreed to provide $3,550 to fund the digitization of the complete run (1957 to present) of the Postal History Journal (PHJ) of the Postal History Society (PHS). The Board of Governors believes that funding the PHJ digitization would be an important contribution towards philatelic research. The total number of pages to be digitized is estimated at 11,680. Scanning will be performed by American Philatelic Research Library staff using the library’s book scanning equipment. Pages will be scanned in color, even if the issue is entirely black and white, for the best image quality. The scans will be delivered in PDF format with optical character recognition so they are fully searchable. The APRL will retain the right to make available to American Philatelic Society (APS) members the scanned issues, presented as whole issues, except for the most recent five years. USSS members, via the USSS website, will also have similar access. 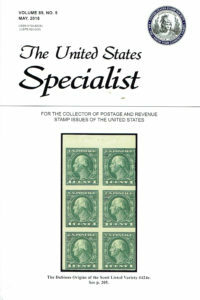 The complete digitized journal will be available to PHS members, and in return for the USSS funding, the PHS will acknowledge USSS support on their website, create a link on their site to the United States Stamp Society, and publish, fee-free, a USSS membership advertisement in all three of their journal issues each year for a period of two years, and thereafter at the discretion of the PHJ editor.